For an activity at my kids' school I built a catapult. 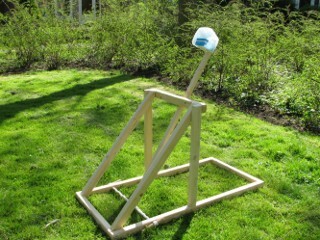 I wanted to build a classic medieval catapult that would be able to propel juice packs in the air. I wanted simplicity so I went for a simple torsion-powered catapult without a sling. 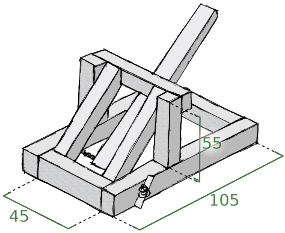 A good source for building your own catapult is stormthecastle.com. This was to original idea for the catapult. The design was loosely based on several online plans I found. I eventually went for relatively light piece of wood for the swing arm to try to transfer as much of the torsion power to the projectile instead of to the arm. The rest of the frame should be mainly in place to handle the blow from the swing arm and handle the pressure from the twisted rope. 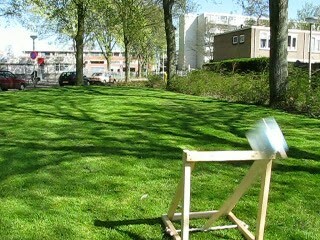 This is the first catapult I built and I think it turned our rather well. Perhaps I could have used heavier wood but this at least makes the thing a bit portable. If the string is wound really tight the bottom pieces of wood start to bend together a bit. Adult supervision is required for operating such a catapult. It houses quite some power and you don't want to hold your head above the catapult when it fires.